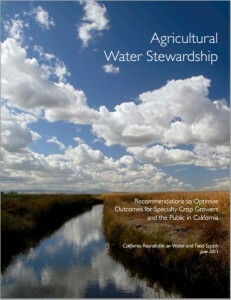 A new multi‐stakeholder coalition of leaders, the California Roundtable on Water and Food Supply, released Recommendations to Optimize Outcomes for Specialty Crop Growers and the Public in California and set of recommendations calling on decision‐makers to employ agricultural water stewardship as a guiding framework to inform agricultural water management in California. Pacific Institute senior research associate Dr. Juliet Christian-Smith is a member of the Roundtable, which, as a group have identified “water stewardship” as a comprehensive concept to guide policy making and practice. Agricultural water stewardship refers to the agricultural use of water in a manner that optimizes on‐farm and regional water use while recognizing the benefits of water for food production, the environment, and human health. Water stewardship practices include water efficiency measures, groundwater recharge and conjunctive management, soil moisture retention and soil health improvements, on‐farm storm water and rainwater storage, and much more. Adoption of many of these practices has been slowed by several factors. The Roundtable’s recommendations identify straightforward administrative and programmatic changes targeted to a range of decision‐makers, including state government, watershed planners, water suppliers, and agricultural advocates. The recommendations seek actions to build a stronger knowledge base to support decision‐making, strengthen the technical support system for farmers, and build more effective policy that produces tangible results. The California Roundtable on Water and Food Supply is a consensus‐based forum of leaders from agriculture, water supply management, government, fish and wildlife, natural resources and stewardship, environmental justice, rural economic development, and academia. Read Recommendations to Optimize Outcomes for Specialty Crop Growers and the Public in California. Read more on the Roundtable.